GadgetStation: How Long will my Replacement Laptop Battery Last? How Long will my Replacement Laptop Battery Last? Often asked is how long with a replacement laptop battery last. This is a good question, which has many factors that can alter the results. All rechargeable batteries eventually wear out with time and usage. The more time a battery is used, the lower the performance you can expect from it. Noticeable slowdowns in runtime can be expected after two years of use. If the battery is constantly used, a slow down in runtime can be seen in 18 months. It is advisable to purchase a replacement battery when the runtime does not meet your expectations. It is not uncommon for batteries working at top performance to complete 1000 charge-discharge cycles before becoming unusable. Following the advice below should help you to maximize the lifespan of your replacement laptop battery. The runtime of a typical laptop battery is determined by the demands made by the laptop computer. If the computer is constantly used or the battery is not properly cooled off it will significantly shorten the batteries life span. Using the monitor at high levels of brightness for excessive periods of time will drain the battery. Lowering the brightness will increase the batteries life span. Also lowering the screen resolution and color depth will increase the battery life. Changing these settings on your laptop is very easy and can save you significant battery life. Accessing the hard drive and use of other peripherals will also drain your laptop battery. Turning off unused devices on your computer will increase the batteries life. Disabling startup items can help reduce use of virtual memory, ultimately increasing the replacement laptop batteries life. The amount of battery life drained will be different for every end-user, as each person has specific settings and external variables that will affect the laptops battery life. It is suggested to use the laptop as needed and not to over use it. A good determinant of batter life can be accomplished looking at milliamp-hours. Every battery has two ratings, volts and milliamp-hours. Milliamp-hours are usually expressed by mAh, a description of the expected power capacity of the battery. The higher the mAh ranking, the longer the laptop battery will last. Avoid low mAh's as they will be short lived. Higher mAh rating is indicative of a longer run-time (higher capacity), and will not cause any incompatibilities. 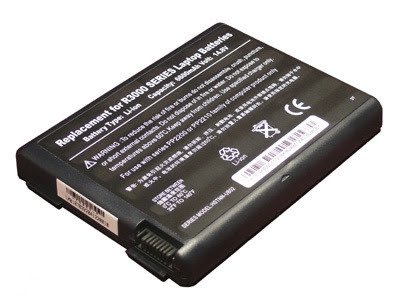 When purchasing a replacement laptop battery, the voltage of the original battery should match that of the replacement battery. The only exception to this is if the batteries consist of different chemistries. Ni-MH and Li-ion batteries have different voltage ratings, even if they are for the same exact laptop. Be careful not to confuse yourself with the different chemistries. All batteries will eventually become obsolete after an extended period of use and abuse. Therefore it is a good idea to have a spare battery incase your battery suddenly dies out or loses its charging strength. Laptop users may chose to use their battery until it completely dies, but it is a better idea to have a replacement laptop battery ready to use when your original battery only runs at 30% of its original runtime when first purchased.